Gold prices moved lower on Monday as the Dollar moved sideways gaining against the yen but losing ground again to Euro. US yields moved higher in the wake of the stronger than expected US retail sales, which was delayed by a month due to the government shutdown. Gold failed to remain buoyed ahead of the Brexit vote which is scheduled for this week. However, the safe haven metal is flashing green this morning, possibly due to the weak tone in the greenback which is ready to take another beating if the US consumer price index prints below estimates, validating Fed's patience on further rate hikes. 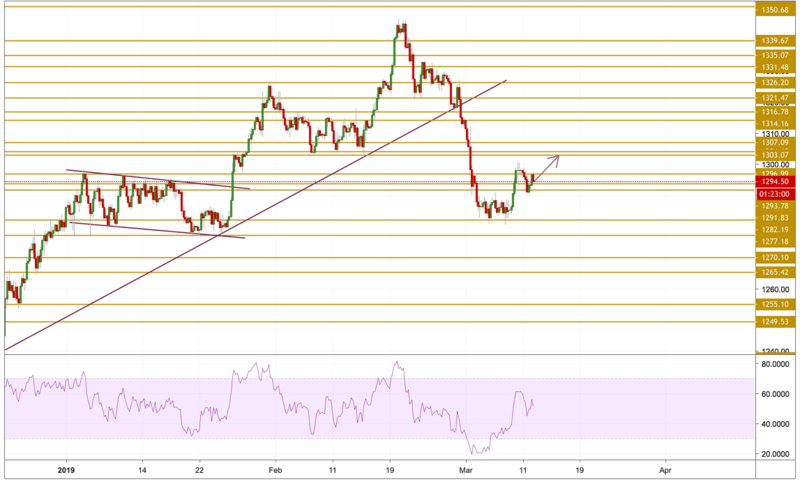 After failing to break above the $1300 level, Gold prices retreated again towards the $1291 territory. The price is currently in a battle with the $1297 level and once this level is violated, we will be expecting a surge above the $1300 level. With a bullish momentum we will be focusing on the $1303.07 resistance level.